Libraries are becoming tech hubs for schools. Libraries are rebooting to become tech hubs for schools. 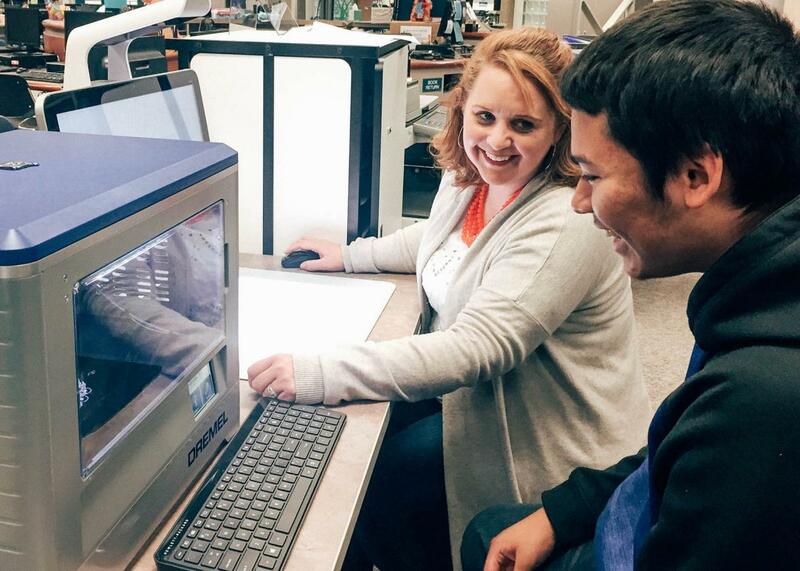 Traci Chun, a teacher-librarian in Vancouver, Washington, and junior Ulises Santillano Tlaseca troubleshoot a 3-D–printing job in the library’s maker space. In many parts of the country, school librarians are an endangered species, with their numbers dwindling near extinction in districts such as Philadelphia and Chicago. In fact, about a decade ago, Chun’s district was on the verge of letting a slew of librarian jobs stay vacant in the wake of staff retirements. A coalition of teachers, parents, and community members intervened to save the jobs, including Ray, a school librarian at the time, who convinced district leaders to repurpose librarians to make them more relevant. That effort began by having Vancouver’s librarians get trained in new software purchased by the district, so that they could train their school colleagues in turn. Teacher-librarians such as Chun have since expanded that tech-integration role. Teaming up with Skyview’s instructional technology facilitator and early-adopting teachers, Chun frequently demonstrates new tech tools at the school’s teacher-led professional development meetings. A key theme of Future Ready Librarians, which last year published a framework to revamp the bookish role, is that districts pouring money into hardware and software need people to shepherd these tools into classrooms and to curate these burgeoning digital resources. The Beaverton School District, west of Portland, Oregon, is a case in point. In 2012, budget shortfalls led Beaverton to axe more than 40 school librarian positions. But two years ago, embarking on a bond-funded technology push that included a computer for every student, the district had a change of heart. It created a new position called “library instructional technology teacher” and has since hired more than two dozen of them. “It became clear quite quickly that an investment in stuff, in boxes that plug in, is not really going to pay off with a lot of learning or classroom innovation unless there’s somebody to guide that process,” said Wayne Grimm, a LITT at Beaverton’s Westview High School. Grimm regularly visits classrooms to brainstorm with teachers about enhancing upcoming lessons with technology or to co-teach a class using a new online database, learning app, or digital media production tool. That could be giving social-studies students a tutorial on research skills; showing a French class how to make stop-action animation, short videos, or websites for presentations on Francophone countries; or helping a math teacher free up class time by creating shareable videos of introductory explanations and sample problems for students. According to Audrey Church, president of the American Association of School Librarians, such duties are a natural fit for a job that long ago expanded beyond book overseer to a combination of teacher, collaborator, and “information specialist”—no matter whether the source of information was the writings of Copernicus or a virtual-reality tour of the solar system. The ongoing conversion to digital resources has given most school librarians a strong background in education technology, and librarians often serve as the de facto custodians for schools’ limited stocks of digital cameras, computer projectors, and similar gadgets. Other paths to tech know-how include district offices of information technology and workshops such as those hosted by Future Ready. And it’s not just districts looking to “save” their librarians that are adopting the new model. Baltimore County Public Schools have a long history of strong school libraries, but five years ago, they redefined the role of their 175 “library media specialists” to include teaching students a variety of analog and digital research and production skills they can use in class. For example, Tressa Norris, a library media specialist at Joppa View Elementary School, recently worked with second-graders on multimedia presentations about American symbols to bolster a unit about patriotism being taught by their classroom teacher. First, Norris led the students to websites that gave a brief overview of what symbols are, and then she prepared students to do their own research by leading “scavenger hunts” into the district’s online databases. After everybody chose a symbol, she introduced the students to options for their presentations, such as creating miniblogs or using a digital presentation tool called Wixie that allows students to weave together text, images, and their own voices. “When they went back to their classroom, they used those tools to make their presentations and talk about being patriotic, without everybody just picking the American flag or the Statue of Liberty,” said Norris. Over the five years of her tenure in the library, Norris has also dramatically changed its look, removing bookshelves and adding comfortable and flexible furniture so kids can move around easily and find places to work and collaborate. They’re losing some shelves in Beaverton’s libraries, too. But the librarians insist that their commitment to books and reading is as strong as ever. Several schools in the district have added small, pleasure-reading libraries to English language arts classrooms, for instance. And libraries can make a lot of room just by thinning out their old, out-of-date reference sections, according to Steven Lent, the LITT at Beaverton’s Mountain View Middle School. “Getting kids reading is still a huge part of what we do here. But the library has to be more than a place where they come in and get their books and leave,” said Lent, who spent the last year, his first as a LITT, opening up the library, adding more power outlets and a wireless projector, and repurposing an adjoining room that had been a cramped computer lab into a maker space with Lego robotics, iPads, and circuitry kits.